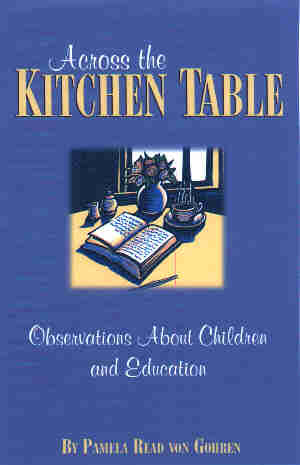 "Across the KITCHEN TABLE - Observations About Children and Education"
Order via check (or money order) with a self-printed order form. FLASH! Focus on the Family has put "Across the Kitchen Table" on their web site along with a sample "chapter". * The Law in Minnesota. (Links to the actual statutes.) Who Can Home Educate?? * CRC (Christian Resource Center)No Longer "CERC"
* National Geographic Geography Bee. Home schooled 10 year old was winner. * Logs of Sailing Vessel MIRADOR Lots of navigation, trip planning, and Mexico (west coast) touring. Have your middle school aged students read Joshua Slocum's adventure sailing around the world alone. * Apple Computer Education Support Site. Go to Amazon.com , Choose the "Books" product tab near the top of page, Then search (in their "Search Options") for isbn: 0880292393 Also read the review. * Smithsonian Home Page . * History Channel What happened in history today . * All the Embassies in Washington D.C.
* Bavaria + Beer + Brezeln = Germany ? -> NO! * School Pages in Germany/Austria ins Deutsch, nicht wahr? * Foreign Languages for Travelers .